Top 5 US-Based No-Kill Shelters Richmond SPCA - Virginia Tompkins County SPCA - New York Dane County Humane Society - Wisconsin City of San Jose Animal Care & Services - California Multnomah County Animal Services - Oregon What Can We All Do to Help Animals? The opinion of animal shelters varies from individual to individual. For the most part, people's opinions on animal rescue are likely dependent on the local animal shelter or animal rescue center they have dealt with - let's face it, not all animal shelters are created equally. This means that they also all set their own policies and are managed differently with varying goals and rules. In this post, we will discuss the types of animal shelters in existence today and what to look for in a good local animal shelters. Plus, we'll take a look at five of the top US no-kill shelters and what we can all do to help make our own area and animal shelters near you a "no-kill zone". 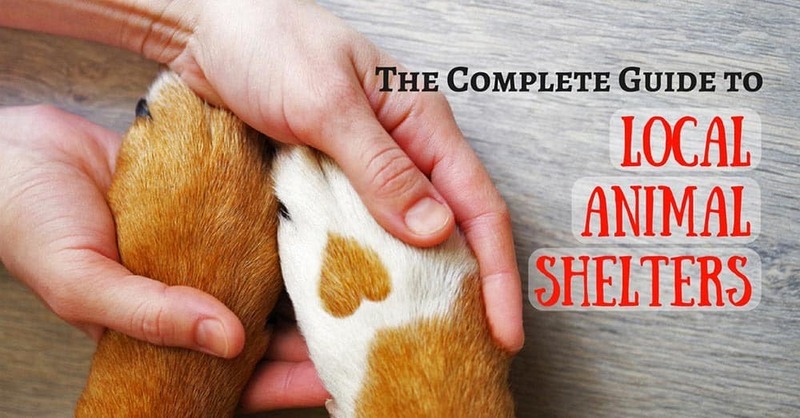 Read on for the complete guide to animal shelters - what you need to know. You may not have known that there are five different types of animal shelters which are categorized as to how they are structured. These include municipal shelters, private full-service non-profit shelters, non-profit full service with animal control shelters, non-profit with limited space shelters and, finally, animal rescue centers. This type of shelter is responsible for enforcing laws and regulations regarding animals according to the state law and will also investigate cases of animal abuse or neglect. Some may even offer educational programs in the community to help further the cause. Some municipal animal shelters will designate their Animal Control to other areas of the city governance such as the police department, health department, department of wildlife etc. In addition, the higher echelon of the municipal animal shelter will usually include a board of directors, a mayor, or whatever office is in charge of the hierarchy of the community. As the name implies this type of shelter runs on a non-profit basis and is usually governed by a board of directors and by-laws that patrol the mission and policies of the shelter. The main goal of the Private Full-service Non-profit Shelter is to protect the animals in the area from neglect and/or abuse. The main goal of the Private Full-service Non-profit Shelter is to protect the animals in the area from neglect and/or abuse. These types of animal rescue centres usually focus heavily on education and spay/neuter policies. In order to be considered a non-profit organization, the shelter has to incorporate the specific purpose of the "prevention of cruelty to animals". Some of these groups do have members that may or may not have voting rights when it comes to the running of the shelter itself. Under this type of shelter's regulations is also the "full service" clause. This means that most of these rescues will accept any animal that an owner has decided to relinquish, and some may also accept strays. This type of "open door" shelter will do it's best to keep animals as long as they can, but will still euthanize when the need arises. This can include for health reasons, poor behavior or the simple (and sad) fact that they are full. Although this shelter is still a non-profit organization, once it has aligned itself with a government agency for animal control it is playing both sides of the fence - non-profit speaks for the animals’ safety/wellbeing while animal control supports the protection of the residences of the community. The reason why some animal shelters agree to animal control is purely for the financial backing of the taxpayer's dollars. Many local animal shelters have no choice as they greatly depend on external monetary support to keep the rescue center running. This shelter is still overseen by a board of directors; however, they must also respond to the "law enforcement" side of the coin such as leash and poop scooping laws, barking nuisances etc. Unfortunately, the Non-profit Full Service With Animal Control facility does have a higher euthanization rate as they are compelled by governmental contract to accept all animals (strays and relinquished). This means that many of these animals will be considered "unadoptable" from the beginning and will, therefore, not be given a chance. In some cases, animals that have not been adopted for a certain amount of time will also need to be put down. This type of shelter is sometimes referred to as a "selective intake” or a “no-kill shelter". This animal rescue center is also run by a board of directors but has a very tight admittance policy, usually fulfilled by a screening test for the animals’ chances of being adopted. The Non-profit With Limited Space Rescue Center can claim to be "no-kill"
There will be more often than not a waiting list to get into this type of shelter, which will depend on space and the adoption status of the animal itself. The Non-profit With Limited Space Rescue Center can claim to be "no-kill" because of their strict acceptance rules; however, that also means some of these animals may wait weeks, months or even years to be adopted. This can be a catch-all for some animal shelters that are riding the line. They may or may not be nonprofit and they may or may not be "no-kill" shelters. The Animal Rescue Group may have an actual building or they can place the adoptees into foster homes until a permanent one is found. The Animal Rescue Group may have an actual building or they can place the adoptees into foster homes until a permanent one is found. Some of the Animal Rescue groups are also breed-specific, with a board of directors and may be operating with a not-for- profit profile. This type of group is usually more realistic about which animals are adoptable and will make good use of the limited resources coming in. Unfortunately, the non-breed- specific animal rescue groups can encompass those people that may pass as "rescuers" but are really just hoarders, to private adoption or to to legitimate nonprofit groups. To find out what category your local animal rescue falls under, simply ask them or research their website for the information based on the above categories. As we mentioned earlier, not all shelters are created equally and, in turn, they are run differently and focus on different things. Moreover, the bad ones are not in it for the well-being or the concern of the animals but more for what they can gain financially. For this reason, we've made a list of things to look for in a good (or bad) animal shelter. 1. Visit the Shelter (often) - one of the best ways to determine if a shelter is well run is to visit it often and even unexpectedly. When doing so keep your eyes, ears and nose open. Determine if the shelter is clean, not cluttered, free of offensive odors and well-maintained. In addition, if you are looking to adopt you will be able to view the animals more than once which will only inevitably help you make the correct choice. Should the shelter deny you access into the facility, you can almost be 100% sure that they have something to hide and are, therefore, not a good animal rescue center. Some good animal rescue shelters may also regularly host an open house day specifically for public visits but you shouldn’t be prevented from visiting. 2. Customer Service - the shelter staff should be enthusiastic to help each potential pet parent. If they are rude, abrupt or disrespectful then this could be a sign that the shelter is not up to par. Bear in mind that many of these groups are truly concerned about the animals’ futures and some may come across as harsh when drilling you as a prospective pet parent. Try not to get offended. Again, this is actually in the best interest of the animal and these people have personally worked with neglected, abandoned and abused animals on a daily basis particularly if the shelter follows a no-kill policy. 3. Kenneled Animals - albeit a very stressful place for animals, the shelter should have each kennel equipped with food, water, toys, and bedding. This should be clean within reason and well maintained. Kennels must be cleaned at least on a daily basis. In some cases, the animal may continuously and accidentally knock over its food or water. To keep the animal from overeating or dry their bowls may only be refilled at certain times. The shelter would be able to tell you if this is the case. Pay attention to the cages of animals that have been there longer rather the ones who just got there. Watch for barrier aggression in the animals and those that seem to be withdrawn or sickly. Do the kenneled animals get enough exercise and attention as well? Population Density - how many animals are housed in the same kennel? Is it one or eight? Are the animal cages stacked on top of each other? Are the animals getting along or do they seem stressed, aggressive, depressed or withdrawn? This type of environment will generally cause the animals to act in a different way which makes it hard to judge their natural disposition and personality though. 4. Staff And Volunteer Turnover – Have some of the volunteers and employees at the animal rescue center been there for a long? Or is it just the owner with regular new employees that don’t stick around? Should the last question be answered yes then there is definitely a reason why everyone quits and this should raise your alarm. ​If you able to view “before” and “after” photos of animals at the rescue, this is a good indication of as to whether the animals are being cared for once they have arrived at the establishment or not. Good animal rescue centers will want to promote adoption and this will include grooming of the animals and even training to raise their prospects. ​5. Volunteer To Animal Ratio – Are there enough volunteers at the animal shelter to provide efficient care to the rescued animals? Are there 70 animals but only two caregivers? 5. What Services Do They Offer - have them walk you through the adoption process Ask questions like what they do in the case of neglect/abuse or a neighborhood animal dispute? 7. Adoption Fees – Certain animal rescue centers will ask for a fee upon adopting. This is to cover all the costs including treatments, vaccinations, and spaying/neutering that they have done for the animal and not at all for profit as many people are inclined to believe. Also, remember that there are still overhead costs to be covered. They should give you a rundown of what specifically was done for the animal and what you will not have to take your new pet to the vet for in the future. No good establishment will demand a donation upon adoption but should rather provide you with a list of the costs to be covered in the fee. 9. Home Visits – The difference between many good and bad shelters is that the latter is more concerned about making a profit in terms of the adoption fees. Although home visits are required by some animal shelters particularly in the case of an animal that has special needs and/or was abused, a red light is if they ask to make a home inspection before the price for the adoption has been established. This action may be for them to determine your financial status and if they can ask more. 10. Finances – Depending on the type of organization the animal rescue center is they may fall into the charity category as they are non-profit. Should this be the case, by law their status should be 401 (c). This means that certain records of their financial status must be made accessible to the public. Should you request these documents and they deny it, it is very likely that they are not above-board if they are within this status. Although you can obtain these records from the IRS yourself, the animal rescue center is actually legally obliged to comply. Once you have decided to adopt a rescued dog, cat, rabbit, bird or another animal from a local shelter, make sure to consider the following before choosing your new pet. A definite advantage in choosing this avenue rather than purchasing your pet from a pet store is that they will likely have more detailed information about the animal. 1. The Reason For The Animal Being In The Shelter – Ask the staff as to how the specific animal that you are considering for adoption landed up in the shelter. It may be something like a divorce, move, financial difficulties or even the death of its owner that would not be the animals’ fault. The reason for this is to determine whether the animal, and in particular dogs for adoption have any behavioral problems. Many shelters would have done some form of evaluation and will be able to tell you what issues the animal may have and if special attention is necessary. This is definitely not a deal breaker as this can be treated but you should just make sure in advance that you will be able to cope until your pet is settled in its new home. 2. Health – Find out if the shelter is aware of any medical issues the animal may have. Once again, it is best to know beforehand so that you can decide whether it is something you can handle especially if the animal will need to be seeing the vet often. It is best to know beforehand if the animal will need to be seeing the vet often. Also, ask if the animal has had any recent surgery or illness. The shelter should be able to provide you with the veterinary records of the animal since its arrival. 3. Age – A lot of people prefer to adopt a puppy or kitten and older animals are, therefore, not always given fair consideration. A young animal will still need to be trained. The advantage of adopting an older animal as your own is that that it will already be housetrained and may not need as much attention as a youngster will require. 4. Assessing the Animal - Remember that the animal may be stressed, unhappy, worried or even scared during its stay at the shelter so it is hard to gauge the true personality of the animal. However, it is a good idea to spend as much time as possible with the animal at the shelter. Stand at a distance and look at how the animal reacts to people but keep in mind the situation where this animal finds itself too. When you approach the kennel for the first time stand sideways at the door to see how the animal responds to you before turning to face the animal directly. The staff members, volunteers or foster parents that deal with the animal every day will also be able to shed much light in this regards as well. If the animal was surrendered to the shelter for whatever reason, the previous owners would have also given the shelter information about the animal which will be handy in helping you make the correct choice. 5. Your Sixth Sense - When you are alone with the animal how does it make you feel? More often than not the animal will show more of its true personality when away from others as well. Follow your gut instinct as this will instinctively tell you whether or not this particular animal is a good match as your new furry four-legged (or winged) friend. 6. Walking – If you are particularly interested in dogs for adoption, ask the dog rescue center if they will allow you to take the dog for a walk as a test drive. This is an excellent way to get the dog to show more of itself as it will be away from the shelter and other dogs. 7. Be Specific – If you have your heart set on a certain breed of cat or dog, inform the shelter. Many dog rescue centers might have a waiting list for a specific breed or may only deal with one. Generally, local animal rescue groups will keep contact with each other and even if the shelter you approached does not have what you are looking for, another might and they will assist you getting into contact. It is a great idea to do some research about various breeds. Although all animals have their own distinctive personalities, many of their traits and characteristics can be attributed to their breed even if they are mixed. Always keep an open mind though because you may be overlooking your best friend due to some or other restriction such as gender or color. None of us want to think about the millions of animals that are euthanized every year throughout shelters all over the world. However, there are some cat and dog rescue centers that strive to reduce the euthanasia rate by working to increase adoptions, promote fostering and help to reduce the population of unwanted animals through spaying/neutering programs and general education. Take a look at these five no-kill shelters that are doing their best to bring homes to the homeless. With their journey as a no-kill shelter starting in 2002, the Richmond SPCA has since managed to save 34,457 lives! They did this by partnering with the city's shelter (Richmond's Animal Care & Control) with the joint goal of ending the euthanization of healthy yet homeless animals in the region. Even though they did have to limit the number of animals they accepted into the system, they have opened a spay/neuter clinic, educated people on what it takes to be a good pet parent and created a thriving foster program. This all paid off and they met their goal two years early with an adoption rate of 75% plus, with no more healthy homeless animals "dying in the city". In the spring of 2004, the opening of the Dorothy and Roy Park Pet Adoption Center was the end result of a no-kill goal for Tompkins County, NY. This facility is registered as the nation's first green animal shelter for its use of sustainable design. It also provides animals of all types a healthy, comfortable and homelike setting while awaiting adoption. Early in 2013, this shelter received a grant from the ASPCA that allowed them to add a van for transporting animals to and from the spay/neuter clinic and to hire an individual to focus solely on the stray cat population. This shelter guarantees the admission of all animals that come to their door and they also promise that every healthy cat and dog rescued will find a suitable home. This includes those animals with treatable medical issues. DCHS is a part of a coalition with the Dane County Friends of Ferals that received a grant (Maddie's Fund) over five years to become an adoption guaranteed community. This was accomplished by transferring animals among the partners, hosting joint events and by the mutual support of each organization. This shelter took some good education from a program launched in Jacksonville and applied it to their own region. Known as the Feral Freedom, this trap-neuter- return program has reduced the feline euthanasia rate by a whopping forty percent! We Care was also formed by Deputy Director Jon Cicirelli and Beth Ward (chief operating officer of the Humane Society of Silicon Valley) which is a coalition of six shelters in the San Jose area dedicated to reducing euthanasia rates. This shelter is a member of the Animal Shelter Alliance of Portland which the largest animal welfare organizations serving the four-county Portland metropolitan area. In this area, Multnomah has become a model of how to successfully reduce euthanasia rates. This is being done by transferring dogs and cats to private shelters, rescue groups, and foster homes for those "greater risk" animals. The process has worked so well that they have been able to save over 90% of dogs and are now implementing several new programs to increase the feline save rate too. We can all help animals and it's not that difficult to do. When you get a cat or a dog be sure to have it spayed or neutered. Adding to the pet population only increases the likelihood of animals being euthanized. Even if you find homes for the litter your pet had, that's taking homes away from those waiting in the shelter system. Should you be seeking a pet contact your local animal shelters for adoption options or make use of animal rescue sites such as Petfinder or The Shelter Pet Project to find an animal shelter near your home. While not all of us are able or willing to open up our shelters or adopt a pet, you can volunteer or intern at your local rescue or shelter. As we learned earlier, many of these shelters run purely on donations and limited funds, so good helping hands are always appreciated. Check out the HSUS site for volunteering opportunities in your area if you don’t already have contact with your local animal rescue center. If you don't have the time to volunteer, then make a one-time or monthly donation to help further the work your shelter is doing. Lastly, spread the word about responsible pet ownership. If we all do our part, no matter how big or how small, we may just be able to wipe out pet abandonment and euthanization altogether. If not, we can surely make a dent in it.